Deepak’s collection was affordable for most part. The dresses were mostly ummm predictable. But as the designer said in a discussion we had that he is ‘comfortable’ in his skin now. He knows what he wants to create and is therefore able to design pieces that don’t try too hard. I loved this look it fun and easy breezy. Fahad Hussayn’s collection had quite a few interesting pieces but this particular look caught my eye because of the gold crop top. The skirt would have been severely boring without it. But with it, a fun wearable look. 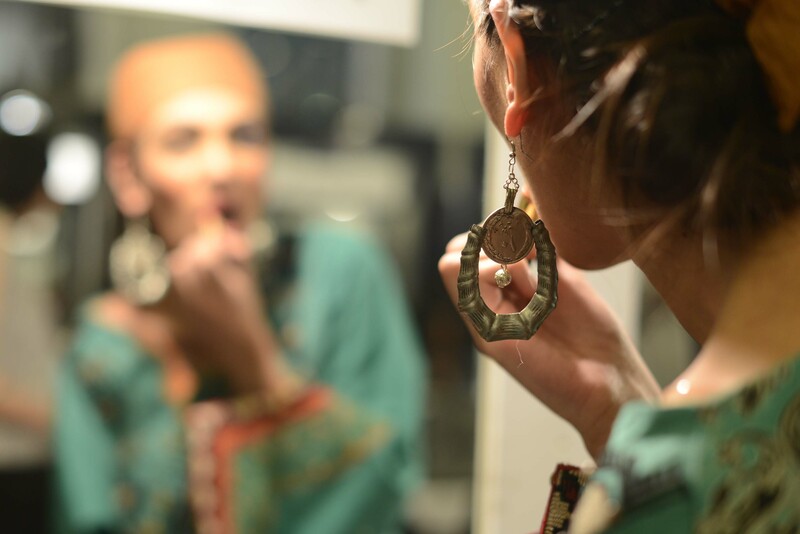 HSY’s Sher was safely the most anticipated collection of this Fashion Week. While the designer revealed little before the show, his presentation on the day was the most elaborate. He unveiled his out reach program, adopting a village and empowering the women by out sourcing work to them. Of course this year also marks HSY’s 20 years in Fashion… With that and the new Pret a Porter store all set to be opened this Friday at the Gulberg Galleria in Lahore, he was the buzz. This particular look I loved with the bold pattern, the high waist skirt and the embellished top. Karma’s Rajesthani Kahani. Effortless and wearable literally off the ramp the white made it one gorgeous summery look. Maria B ‘s Laddakh Connection. The Chevron cigarette pants with an Ombre aqua to emerald top was safely my fave! Nida Azwer was more ‘in your face’ like some of the other designers. Her work is beautiful and understated just like her which is why it sometimes tends to go unnoticed. Needless to say some of her pieces this time were as usual beautifully thought out. My favourite from the collection was the zebra print border on this dress. Sania Maskatiya’s collection was predictably feminine and beautiful. Silk prints, this time inspired by Africa were showcased look after look till this one which practically took my breath away. What seems like a monochrome dress opened in the front to reveal a rainbow of colours. Lurveeed it! 5 FASHION PHASES OF KARACHI WINTER!